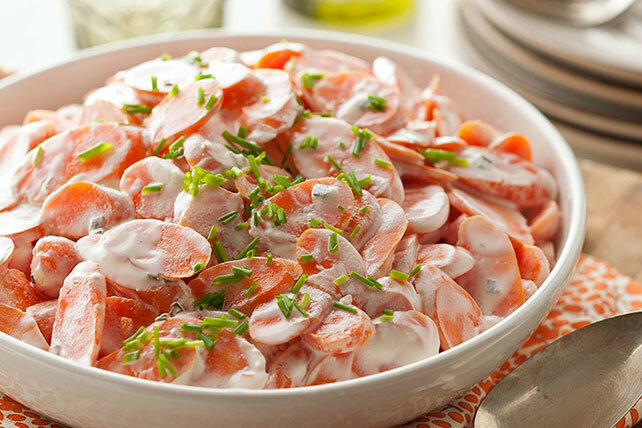 The plain Jane of veggies gets a saucy makeover with cream cheese and chives for a whole new way to love carrots. Bring carrots and broth to boil in large skillet on medium-high heat; cover. Simmer on medium-low heat 8 to 10 min. or until carrots are crisp-tender. Uncover; simmer 8 to 10 min. or until most the broth is cooked off and carrots are tender. Remove from heat. Add cream cheese; stir until melted. Sprinkle with chives. Substitute green onions for the chives. Serve topped with freshly cracked black pepper. To prepare this recipe for Passover, select food products that are kosher for Passover as needed. Consult with your rabbi if you have any questions.